Elite's 25,000 square foot plant includes a large warehouse section. 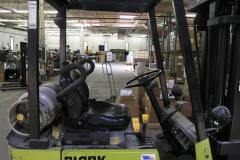 We can store a portion of your order for shipment at a later time. In this section you'll find information regarding the people, culture, and physical plant of Elite Envelope and Graphics, Inc. If you want to know where we're located, our hours of business, or simply what makes us tick, just follow the provided links for more information.